Summer is just about here and our family loves spending time outside and in our backyard. 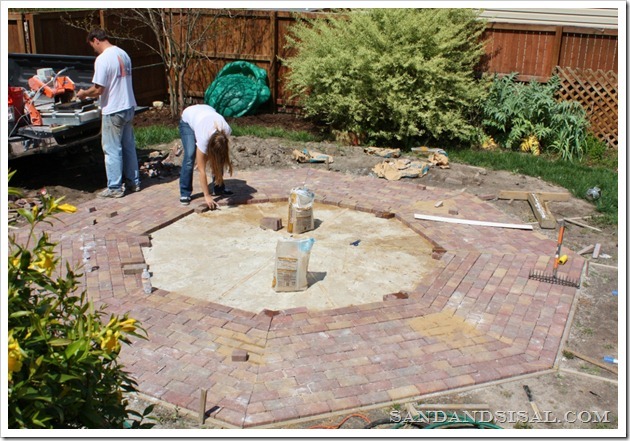 I don’t think I’ve ever revealed our entire octagonal brick patio on the blog after it was finished. 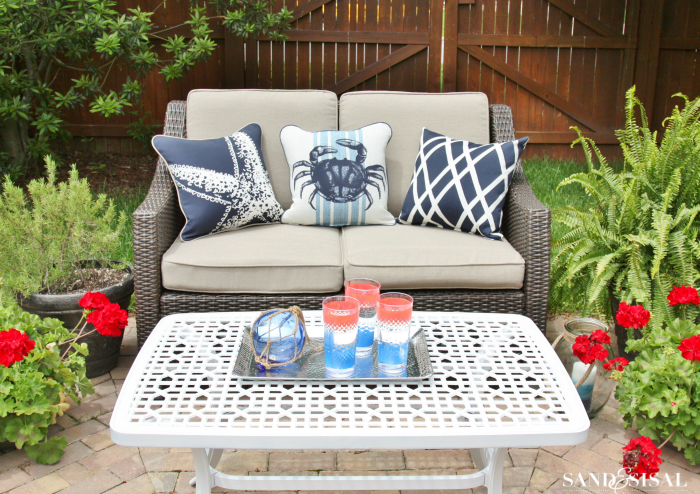 So I’m excited to share my Red, White, and Blue Coastal Patio with you today and I have a cool cash giveaway too! We started building this patio back in 2012 and it took forever to complete because we had never attempted a patio before, let alone one shaped like an octogon! We also only worked on it maybe once a week. I was so relieved when the octagonal brick patio was finally complete! We ordered patio furniture last year for our daughter’s outdoor graduation party. Sadly none of it arrived in time for the party and we had to borrow tons of furniture at the last minute from our fabulous neighbors. It finally arrived a week later. This year I was excited to really make this patio into an inviting space for entertaining and relaxing with friends and family. And of course, I had to add a bit of a coastal touch to it. The theme for the decor is red, white, and navy blue with some nautical accents. I love candle light and a roaring fire at night, so a few lanterns are placed around. The glass hurricane lantern above is from Kirklands. I need to invest in some plastic outdoor LED candles because wax and 90° don’t play nice with eachother (that poor little guy above is now a blue puddle… sigh). I love, love, love all of these outdoor pillows I found at Target! If you have been following me on Instagram then you know I was eyeing that cute crab and starfish pillow all spring! They are from their Theshold collection and are treated with scotchgard and resist UV fading. The coffee table received a mini makeover with spray paint. It used to be black. It looks like new once again! The love seat and coffee table are flanked by a Boston Fern, a fragrant rosemary bush, and 2 beautiful red geraniums which will bloom all summer long. The ceramic flower pots also received makeovers. I’ll share that tutorial soon. 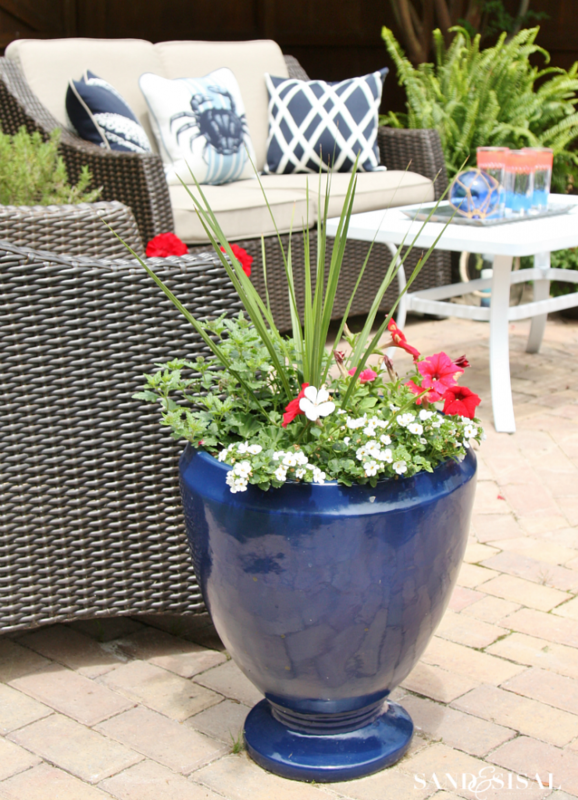 They are filled with spike plant, red petunias, red and white geraniums, red verbena, blue lobelia, white bacopa. Of course the night before I shot this photo, a huge thunderstorm came through and blew away almost all the blooms…grrrr. We love to string up white lights in the trees for summer parties and hang paper lanterns with small LED votives inside. It makes the backyard look majical! Do you recognize the ceramic planter side table? I spruced him up too! (tutorial later this week). Here is a view of our deck… you can’t see much of it because the roses and Carolina Jessamine Vine are going crazy right now! 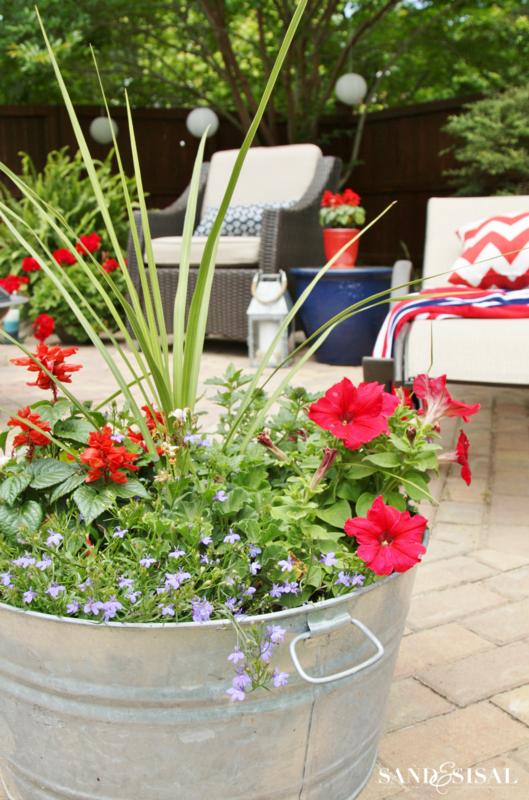 An old galvanized wash tub is now serving as a pretty planter. 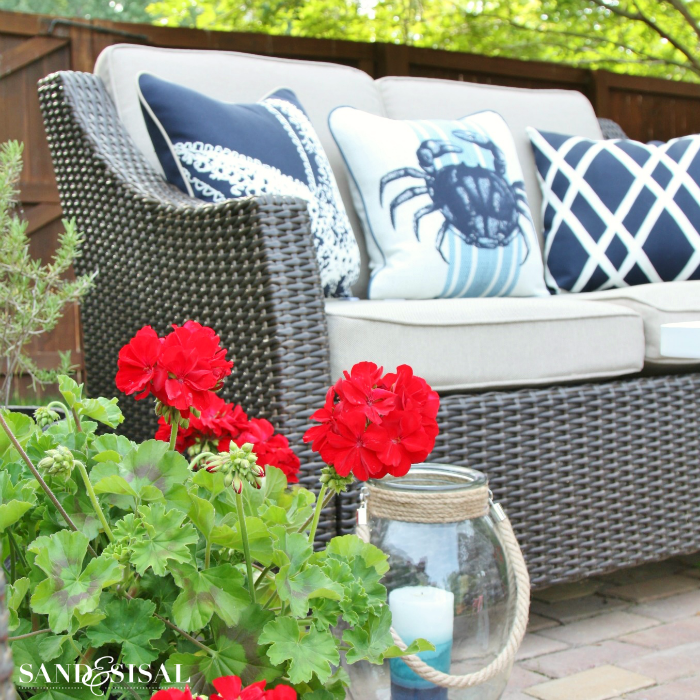 I love how our red, white, and blue coastal patio has all come together. You know where to find me each evening. I’ll be the one on the loveseat with iced tea in hand! Come join me! 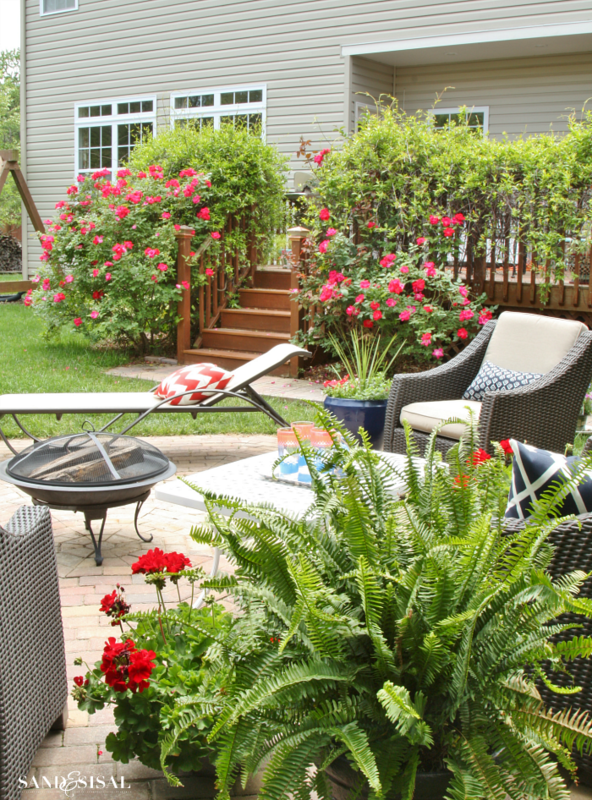 Ready to be even more inspired by some Sensational Summer Outdoor Spaces? 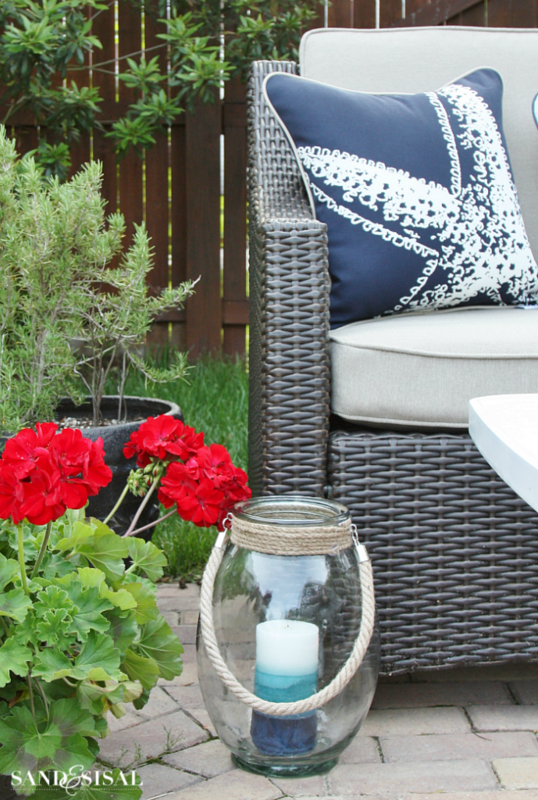 I’ve teamed up with 14 other blogger friends to show you different and creative ways to spruce up your outdoor space AND we have a giveaway for you to help you get started! Click any of the links below to see their spaces. 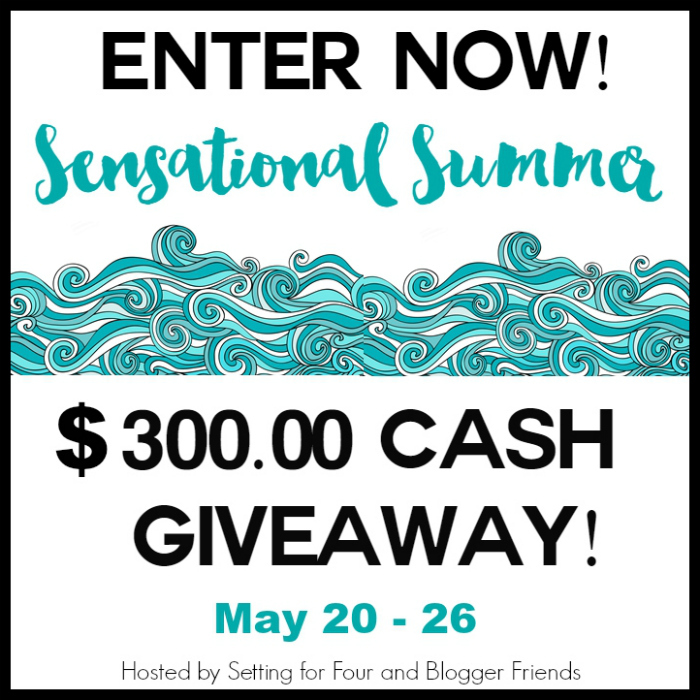 To celebrate the start of summer we have an AWESOME Sensational Summer Outdoor Spaces Cash Giveaway for you! 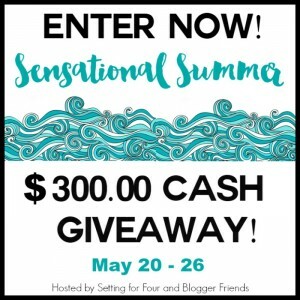 Enter to win $300 PayPal CASH! 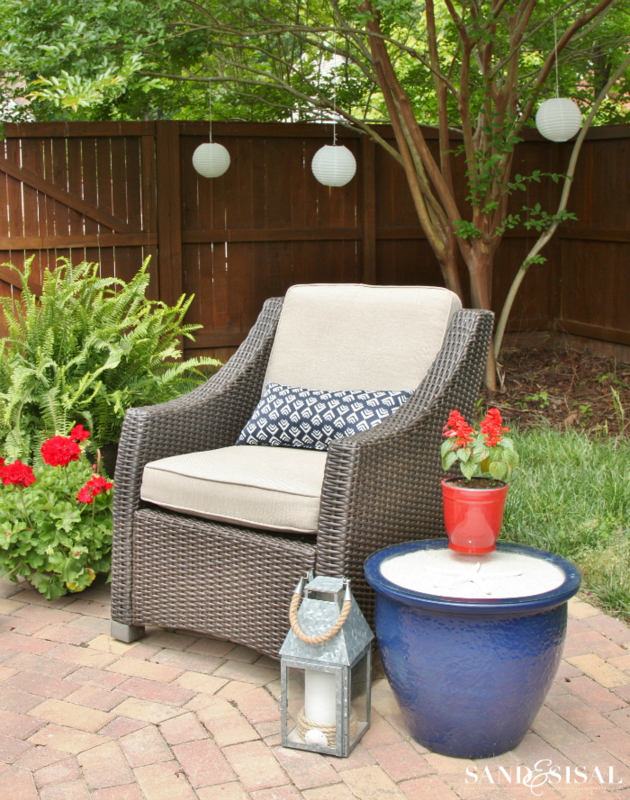 Now it’s YOUR time to link up any OUTDOOR PROJECTS & SPACES you have been working on! I think the patio is the best place to decorate. First time on your blog. Your patio is great and soooo relaxing it appears. 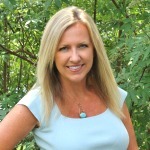 I look forward to adding your blog to my daily blog read. your patio is amazing. I love when patios take on different shapes and curves…ask my husband. he rolls his eyes every time I tell him i don’t want straight lines. enjoy the season and that patio! Your patio turned out absolutely beautiful! I would spruce up our own brick patio with new furniture……. If I had a new deck I would love to decorate it! The link to follow Town and Country on Instagram does not work or there is a problem with that webpage. I love the look and how your patio all came together. Thanks for the wonderful ideas! What a pretty patio and I love the octagon shape! Beautiful patio… I love the brick. Looks fantastic! I too need to invest in plastic flameless candles. The two I’ve had on my deck now look like hunchback candles! Yikes! I’m moving next week and so excited to finally have a front porch! So cute, in process of redoing our patio area now. What a gorgeous outdoor living space! It’s hard to wait for things to come together… but your wait was so worth it!!! LOVE the red white and blue nautical theme! Those little paper lanterns took our patio over-the-top!!! Oh, Kim, this is such a beautiful space. The color pallet is one of my favorites for summer….red, white and blue. I also really love the shape of your patio. My oldest son is trying to talk me into doing a patio in the area where we used to have a pool but I don’t think I’d ever get it done! I’m happy to be partying with you again…it’s been a while. Your backyard looks so wonderful! I would love to redo our upper deck. We need some new furniture and plants up there. I love the shape of your patio! Great design ideas. I have a patio similar to yours that is in sore need of need seating. Love your style. So inspiring…slowly but surely !! I love the idea of stringing paper lanterns with electric votives from the trees! I’m going to have to try that at our next summer party! Great idea! Our front and back porches on our new farmhouse! That would definitely be our backyard patio. We love to spend time out there. I love your patio! It gives me hope for my back yard. This year I’ve been focusing on my front porch though. Got new outdoor pillows from Target too just recently and am sprucing up my vintage metal spring chairs. Thanks for always inspiring. Your patio looks stunning! It gives me great ideas for when I get ready to set up mine, love the round brick patio. I love to decorate my deck the most. This is where we entertain and just relax. I love to decorate my patio the most!!! I love to decorate our screened in porch. GA-ORGEOUS Kim!!! Love all of your red white and blue touches!! What a cozy relaxing patio you’ve made and I’m super impressed with your octagon design of the brickwork!! So fun to party with you! Love the color scheme, and just think, you are set for Memorial Day and the Fourth Of July! It looks fabulous! I love the color scheme and that crab pillow is so cute! I love to decorate our screened porch the most! I enjoy decorating our deck. I would probably work on the front porch- it needs painting and to add some color with hanging baskets. Could also do the back patio- I have my eye on a dining set. Too many options!! My patio! It’s where I spend as much time as possible. 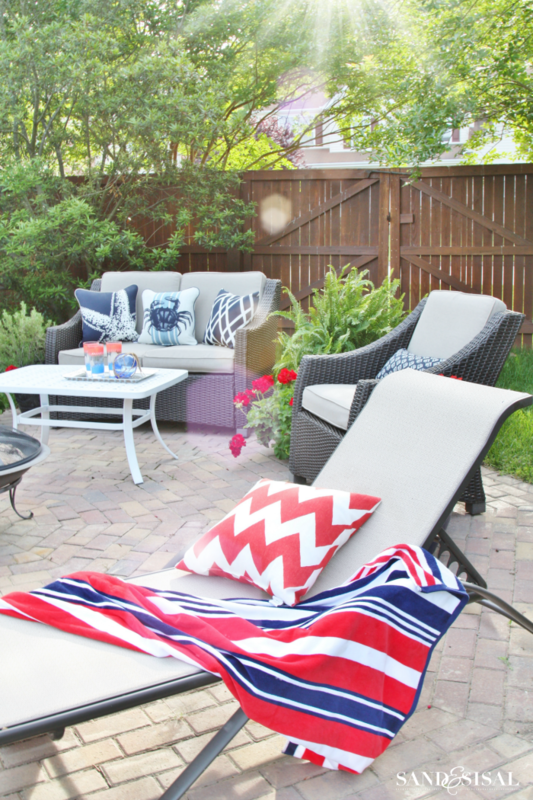 Looks so inviting Kim… love how you did your patio! 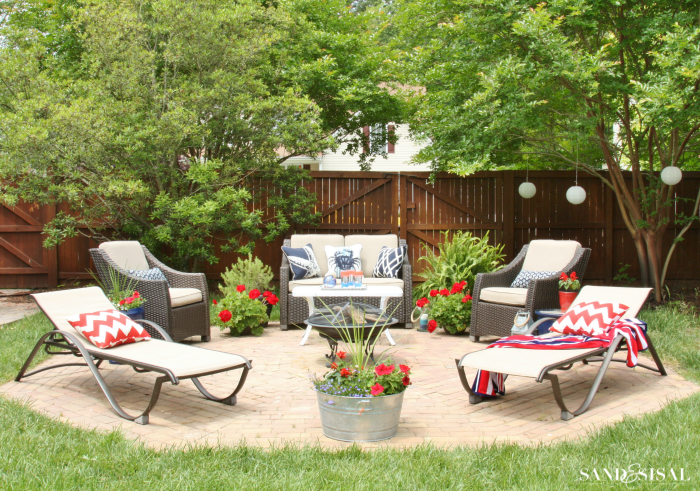 I just did a blog post this week on red, white and blue decorating…would have featured your gorgeous patio if I had seen this post!! Loving everything- those pillows!!! Wow, that patio is so great! I can’t believe you and your husband built that yourselves- I wouldn’t even know where to begin. It really looks beautiful with your furniture and accessory choices. we’ve talked about for the last few years, but something else always comes up! Thank you so much for sharing your lovely patio with its nautical theme! I love the starfish and crab pillows!! Oh, and all the fabulous sensational summer spaces! Our patio is where I put most my efforts. That is where we spend most of our free time as a family. Also I can see it through my dining room window and it’s a lovely sight while eating. I’m a new homeowner so this is my first summer with an outdoor space to decorate! I’m working on our front patio first since that’s what most people see. Our backyard will probably have to wait until next year…there’s just so much to do! Your red, white, and blue theme looks adorable. Our house is red and white so I’m planning on a similar color scheme as yours. Love this! I’ve seen all this in Target. I think the patio and front porch are important to deocrate because thats where we (my family and I) spend most of our time. I love working on my. 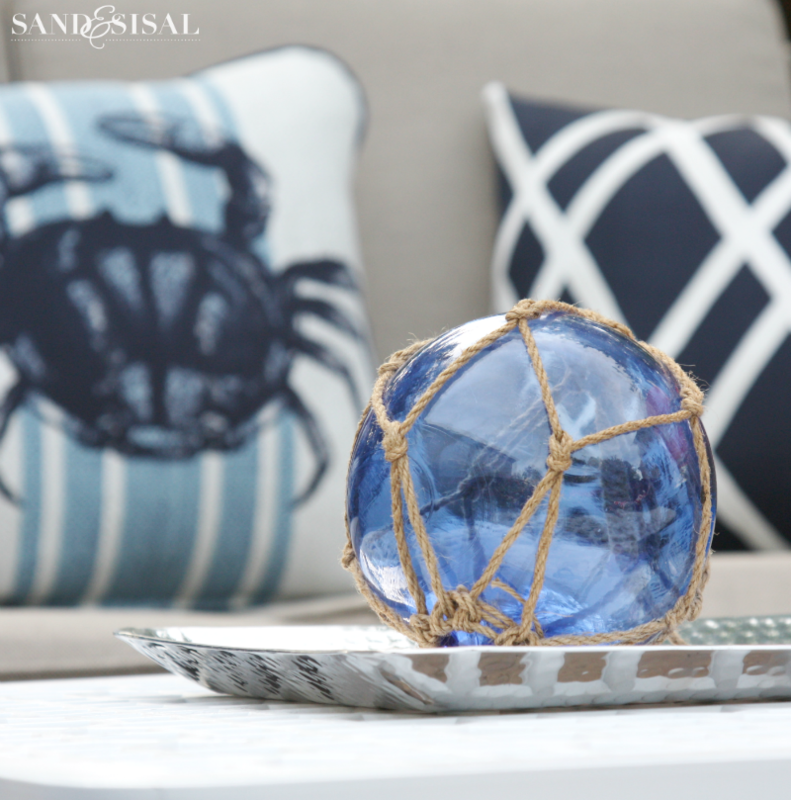 DIY coastal sunporch…bit by bit! Wow! 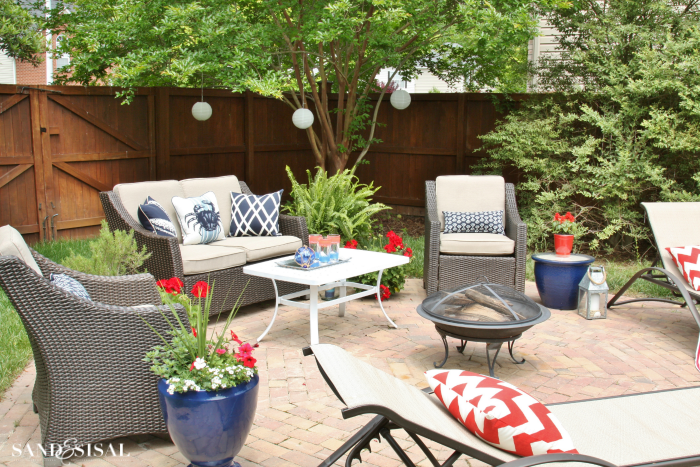 Your backyard space looks amazing! I would love to build a back patio off our deck in the near future. my favorite way to decorate is coastal. love, love, love it! Your patio looks amazing! That patio is stunning!! I know it was a lot of work too but it turned out great! I love my pergula patio! Your style is my style..love the beachy cottage look. Although I start with my southern porch I decorate the seasonally my entire home. One of my favorite things to do other than collect. This is a fantastic giveaway. Thanks for offering it and introducing me to other bloggers too. The Target pillows are a great addition. Love them.